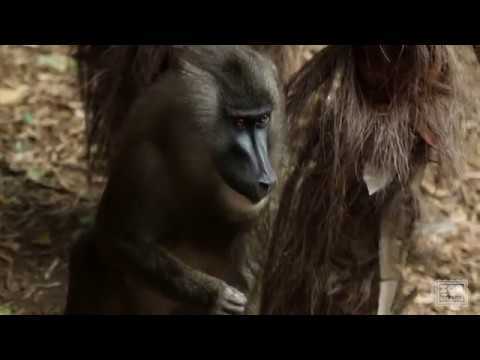 Drills are very distinctive primates that are related to baboons. They live in complex social groups led by a single dominant male. Social interactions are mostly focused around grooming, and communication comes in the form of visual displays and vocalizations. Deforestation and unsustainable harvest for the commercialized bushmeat trade are creating an uncertain future for this species. Best viewing is either from the deck overlooking the drill habitat or from the large window in The Living Treehouse. Drills remain indoors on colder or very rainy days and have the option to be indoors or outdoors. Drills walk on the flat surfaces of their feet and hands, not on their knuckles as do the great apes. They live in multi-female troops with one or more males, sometimes totaling 20 or more animals. There is one dominant male per troop. They communicate through a variety of deep grunts and sharp cries, as well as body movements such as lip-smacking, grimaces and teeth displays. Presenting the buttocks is a sign of submissiveness or solicitation. Females and youngsters will display this way to the dominant male (and even to their care team). Males will present in this manner in order to solicit grooming from another individual. Grooming is a common and important social behavior that establishes and maintains social bonds within the troop, as well as promotes health and cleanliness by removing external parasites such as ticks and fleas. Major threats to drills in the wild include deforestation and, especially, the ever-expanding and unsustainable trade in wild bushmeat that harvests wild animals for human consumption in local villages and shipments to large cities regionally and globally. Drills have cheek pouches that may expand for storing food short-term and can hold as much food as the stomach. The distinctive reddish coloration on the rump is not pigment, but is rather the result of a concentrations of capillary blood vessels near the surface of the skin. Increased blood flow here during periods of excitement enhance the coloration and may act as a beacon to enable the troop to stay together in a dim forest. The hue also gets brighter as an animal attains maturity and rank. Male drills weigh 80 to 110 pounds and are much larger than females, which weigh 30 to 45 pounds. Males have an area of red skin between the lower lip and chin and long canine teeth (1½–2 inches). Males also have a large mane. Males are sexually mature at 5 to 7 years old and females at 4 to 5 years old. Females have pronounced swelling of their perineum about every 33 days. Swelling takes about a week to become full size. Estrus lasts about three days, and then the swelling will diminish in another three days. Young are born seasonally. Birth season is thought to be between December and April. Gestation lasts 5½ to 6 months. Females usually have a single baby. Twins are rare, as it would be difficult for the mother to carry two infants rapidly through the forest. In the wild, females will usually not breed again for two to three years after giving birth. Lifespans in the wild are about 20 years; the record in a zoological setting is 46 years. Drills are only found in undisturbed and large patches of lowland rainforest. Drills are primarily vegetarians but are also known to eat small invertebrates. In the Zoo, they are fed mixed salads of fruits and vegetables. Animal care professionals have seen them catch and eat insects that wander through their habitat. Enrichment is a crucial part of raising healthy primates in zoos. Our drills are given varieties of foods, sometimes with randomized timings. Additionally, they are given objects to manipulate and explore and thought-provoking items such as puzzle feeders, novel scents and other unique stimuli.